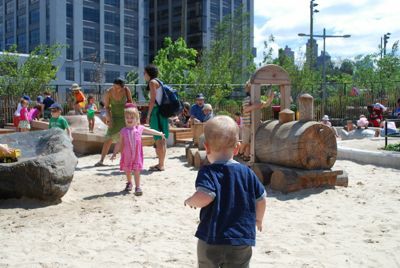 The new Pier 6 playground opened up on Pier 6 of Brooklyn Bridge Park, at the base of Atlantic Avenue. 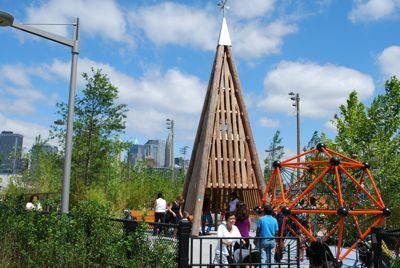 This is at the opposite end of the future Brooklyn Bridge Park from Pier 1, which opened in the Spring, and features the much-anticipated “destination playground” that was promised as part of the park’s construction. We've visited to give you a preview of what you can expect at Brooklyn's latest addition. 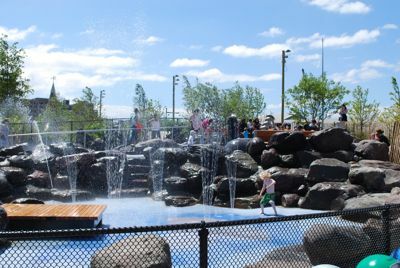 The new playground is significantly bigger and nicer than the new playground at Pier 1 and is divided into four different play areas: (1) The Waterlab, which is the home of the water elements designed to not only get your child wet but also teach him or her about the physics and dynamics of water, (2) Slide Mountain, designed for children ages 5-12, which has several long and fast slides plus a climbing dome, (3) Swing Valley which, just as it sounds, is where the swings are and (4) Sandbox Village, which is a large enclosed sand area filled with ceramic and wooden structures. 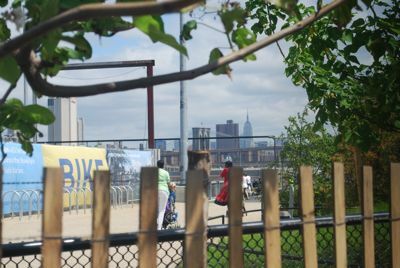 There isn’t actually any park yet surrounding the playground, just a lot of construction, but there is a ferry landing from which free ferries are running from Pier 6 to Governor’s Island on weekends all summer. 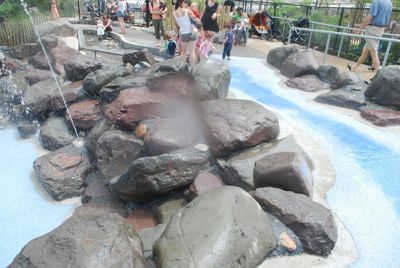 The Waterlab has been the largest draw and most crowded area in the new playground since it opened, partly because the Waterlab is a truly new playground experience and partly for the simple reason that it has been so hot. The water elements are all great, and the area is built so the water from the top area flows down as a stream into the sprinklers at the bottom. 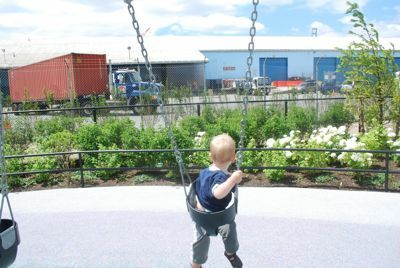 However, after the troubles with the metal domes at Pier 1 Playground, I was on the lookout for potential dangers in the new playground and the Waterlab has at least two dangerous elements. First, as I learned from first-hand experience, a young child can quickly fall head first and submerge himself into the pool of water at the top of the Waterlab. Second, the boulder cliff separating the top of the area from the bottom has nothing protecting children from running or falling off the rocks – I overheard one mother call this the “cliffs of despair” – and the staircase connecting the two areas is slippery and has no guard rail. It also makes sense to be careful generally, since the area was designed for children ages 5-12 and each time I’ve visited it’s been filled mainly with children under 5. Also, like Pier 1, the tree cover is still years away, so it is very, very sunny. Be sure to bring sunscreen and lots of water . . . . but be warned there is no bathroom, just some port-a-potties. 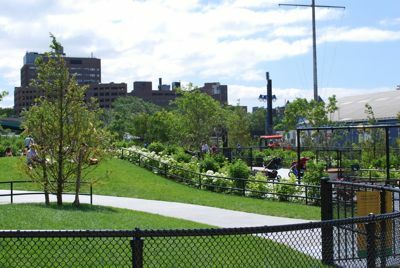 And unlike Pier 1, the playground’s views of the water and downtown are blocked by construction and future elements of the park. On the other hand, Pier 7 right next door is an active pier, meaning if your child is as obsessed with trucks as mine is, he can enjoy the view of trucks and cranes from the swings. 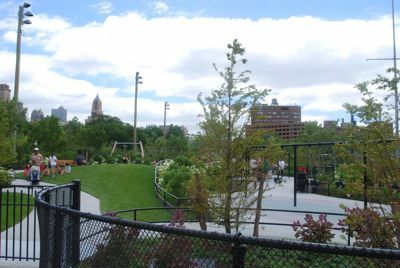 While you are already in the area enjoying Pier 6, or if the playground is too crowded (as it often is), consider checking out the underused Van Voorhees Playground (on Congress Street between Columbia and Hicks Streets) and Palmetto Playground (which has an entrance on Atlantic Avenue between Hicks Street and the BQE on ramp). Both of those playgrounds have water elements plus the standard swings, slides and climbing equipment. These are the "cliffs of despair" . . .
For more great destination playgrounds check out our post on the Billy Johnson Playground in Central Park, or the New Union Square Playground.